The Wahoo (Acanthocybium solandri) is a razor toothed predator that relies on speed. It is one of the fastest fish in the ocean and has bright blue bands that light up when the Wahoo feeds. Wahoo tend to be year-round residents in tropical waters, but they expand their range to more northern latitudes during the summer months. More exactly they are found in tropical and subtropical waters of the Atlantic, Pacific, and Indian Oceans, including the Caribbean and Gulf of Mexico. 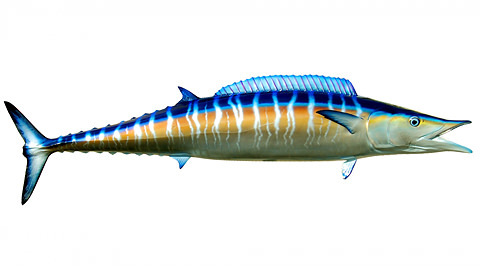 In the Pacific, Wahoo are found between 46° N-35° S latitude. Wahoo are covered with small scales and are steel blue above and pale blue below. It has a series of 25 to 30 irregular blackish-blue vertical bars on the sides. The Wahoo fish has a large mouth with strong, triangular, compressed and finely serrate teeth. Its snout is about as long as the rest of the head. The maximum reported size for Wahoo is 158 pounds (IGFA World Record). Wahoo commonly attain sizes between 40 and 65 inches in length, with maximum size reaching 98 inches. Wahoo are greedy predators, feeding on mackerels, butterfishes, porcupine fishes, round herrings, scads, jacks, pompanos, and flying fishes. They generally compete for the same kind of food as highly migratory tuna.